Sometimes when you travel, what sticks in your mind more than all the religious and historical sites, the wildlife or the scenery, is the amazing friendships you make along the way. Imran, our tuk-tuk driver in Jaipur, is one such friend. 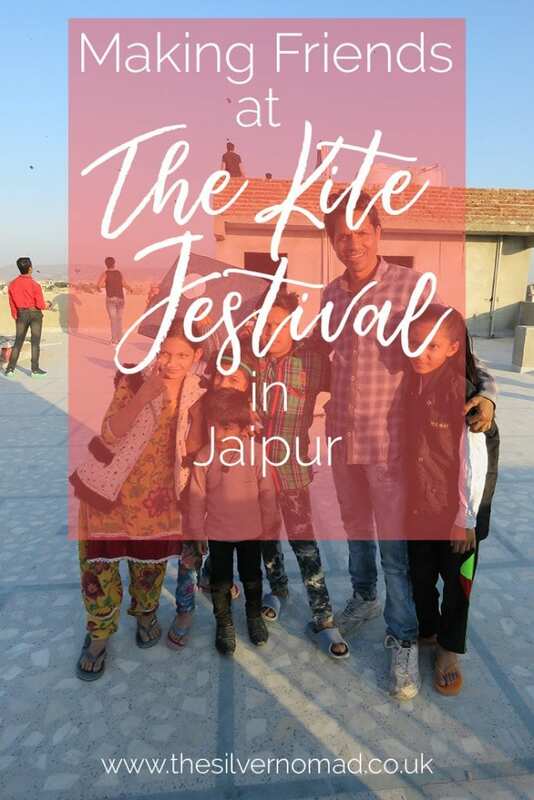 He invited us to join his family for the Kite Festival in January, a magical evening which was one of the highlights of our visit to Jaipur. Imran had taken us to see the kites flying in the Kite Festival down by Jal Mahal on the Mansagar Lake. But to be honest, we were a bit underwhelmed and didn’t quite understand what the fuss was about. We had imagined beautiful big kites, but these seemed to be small rectangles. We had been told of kite battles; people using wire instead of string and strings being cut, but we saw none of that, just kites flying. As the afternoon wore on, we turned down a side street and pulled up at a small stall – the only stall in the road, but a stall that sold kites! Imran asked us to choose a kite each, which he paid for, then told us to follow him. We walked around the corner to a house that looked semi-derelict, not sure if it was half built or half torn down. The stairs were rather treacherous, but we climbed up each floor holding on to the wall and then emerged into the light on the roof terrace. The first thing that hit me was the noise! On street level it was quiet, but up here everything was amplified. The traffic noise, music playing, the hubbub of people, it was all competing but strangely harmonious. Everywhere we looked, you could see kites. You can see my rather dodgy video below. 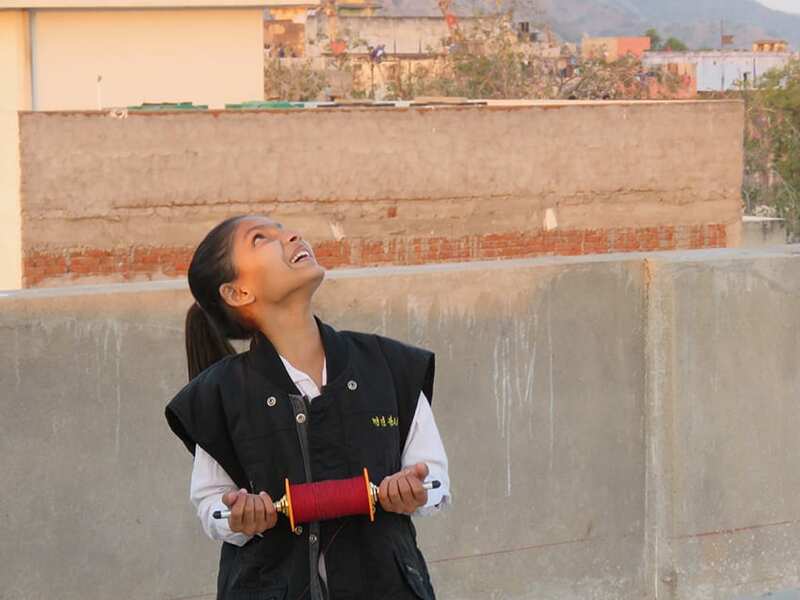 On the terrace, men and children were milling about, laughing, joking, flying kites. It was delicious mayhem. I looked around me. 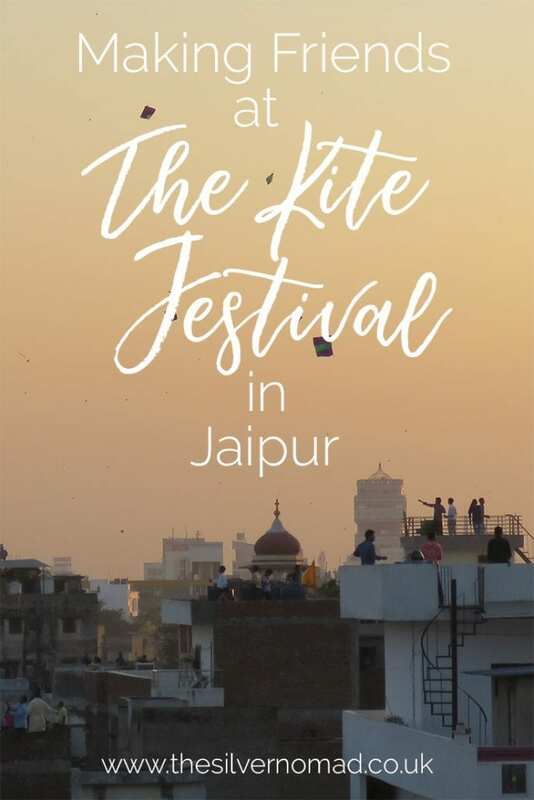 The air was filled with kites, swooping and swirling, some entangled in trees, their brief life over, others soaring, then dipping, a kaleidoscope of colours. 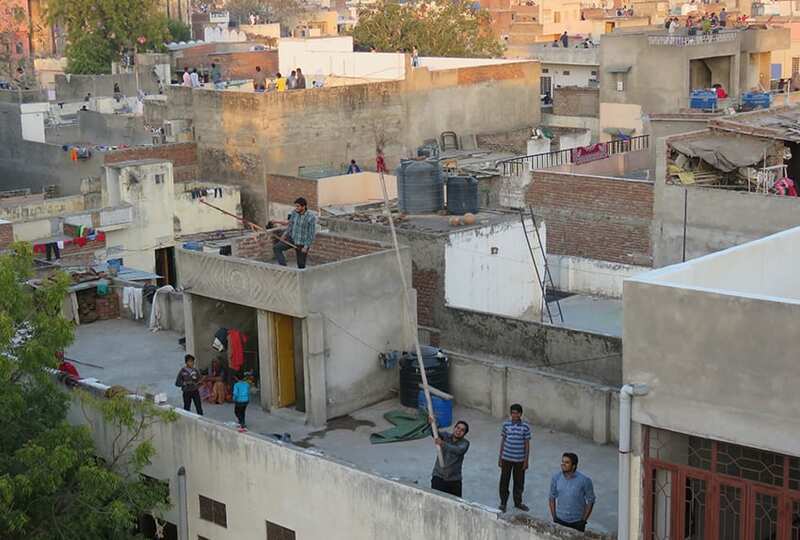 Every rooftop, higher or lower than us, had people flying kites. It seemed like a family event, mothers, fathers, children, the old and the young enjoying the Kite Festival. It was truly a festival for the people. The kites were attached to long strings fed from two-handled spools. Part of getting the kites up in the air included tugging of the strings, to get them higher and higher, avoiding any powerlines and letting them do acrobatics in the air. Alan seemed to master it quite quickly, but I struggled a bit. The kids, however, were adept at it and giggled at my attempts. There were constant whoops and calls, and I noticed that some of the guys had long poles which they were waving about in the air. Curious as to what these were for, I asked Imran. He explained that they were used to catch kites that had broken strings, and this was part of the game they all played to catch each other’s kites while trying not to lose any of their own. These were the battles we had been told about. Chai and nibbles appeared and we were invited to join in all the festivities. We played with the children, taking slo-mo videos of them jumping, taking selfies and photos, which amused them greatly. They also sweetly tried to learn a few English words. As dusk started to fall, I thought that the fun was over, but Imran’s brother appeared with floating lanterns and we eagerly set them up and lit the small fires below them before launching them out into the open air. Some fell to the ground, but others soared, filling the sky with their brilliant dots of light. It felt like quite a spiritual thing to do, so I wrote on my kite “Blessing and good wishes to Imran and all my new friends”. Soon the sky was full of lanterns all floating up and away. Suddenly, the sky erupted with so many fireworks that it would give any Health & Safety Officer palpitations! Everywhere we looked the sky lit up with reds, greens, whites and gold, a glittering array of colours. I felt like a child again and was twirling around clapping my hands in glee. 360 degrees of fireworks. Every rooftop seemed to be alive with fireworks, explosions burst across the sky while the lanterns gently sailed in between. It was a truly magical and mad sight and one I will treasure always. 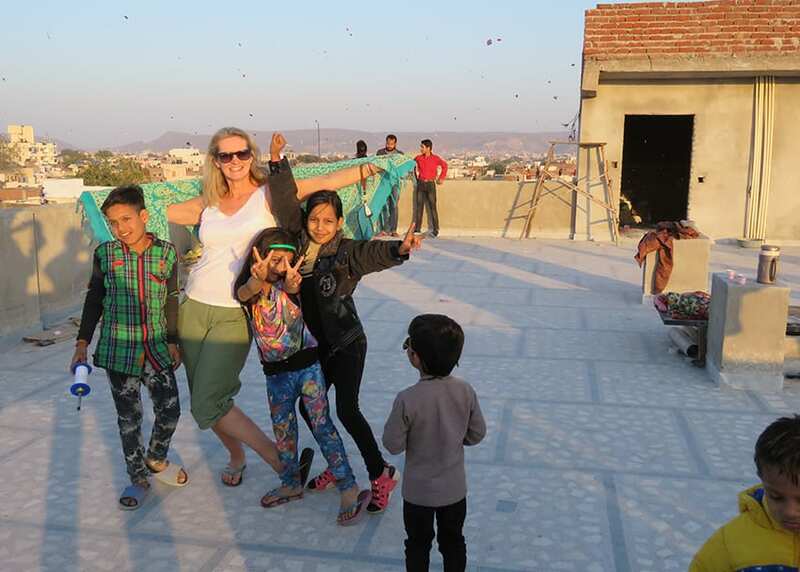 This was just one afternoon on our 16-day trip around Rajasthan, but it was the most memorable, we had fun, we had an amazing, unique experience and we made lots of new friends. 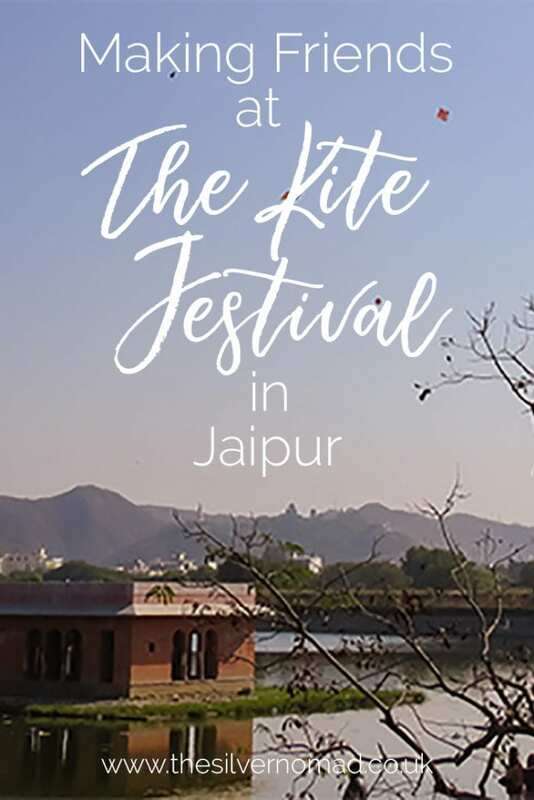 The International Kite Festival in Jaipur takes place on the 14th of January every year. 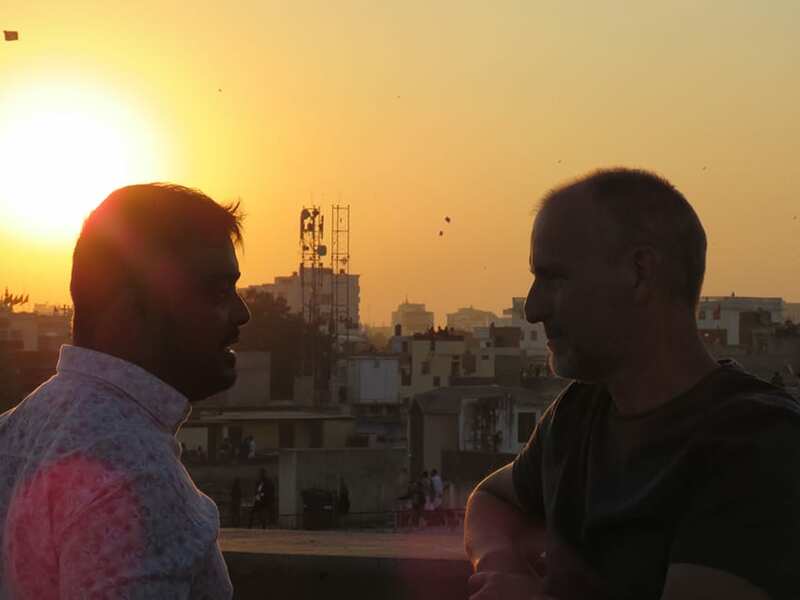 I cannot guarantee you will meet someone like Imran who will share their family evening with you, but do try to get to a rooftop and watch the spectacle. If you are visiting Jaipur, check out the Get Your Guide tours available.